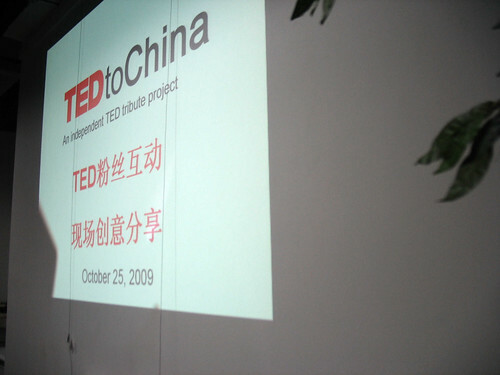 The TEDtoChina project was founded on October 25, 2008, as an independent TED tribute project that uses the TED logo with permission from TED. Its three main activities currently include TEDtoChina Chinese site (http://www.TEDtoChina.com), TEDtoChina English site (http://en.TEDtoChina.com), and TEDtoChina offline events. TED (Technology, Entertainment, and Design) is a conference, gathering the world’s most fascinating thinkers and doers to disseminate their ideas. Operating as a free culture project http://eduaidguru.com/ and an education project, TEDtoChina aims to distribute TED’s inspiring and enlightening ideas to China. We hope to foster citizen spirit that can be a force for good in local communities. Be part of the change—that is a resonating idea at TED—and we want to bring this idea to people through our coverage. TEDtoChina was co-founded by TEDIndia Fellow Tony Yet and TED enthusiast Oliver Ding. It is currently managed and supported by English and Chinese bilingual volunteers from regions such as mainland China, Taiwan, Hong Kong, U.S.A, and Australia, UK,etc.In December 2009 the board of TEDtoChina was formed with five members: Isaac Mao, the founder of Social Brain Foundation; Andrew Yu, the founder of 1kg More; Qingqing Qiu, the head of Social Innovation Initiative at China Social Entrepreneur Foundation and a co-organizer of TEDxBeijing; and Tony Yet and Oliver Ding. We run TEDtoChina as a TED inspired and focused translation and education community with both online and offline presence and outreach. Like a web bridge it attempts to bring more inspiring educational contents to the Internet community in China. TEDtoChina also builds the Chinese TED community through various online social networking tools. It runs groups on various popular social networking websites. The TEDtoChina Chinese site covers TED talks, TED Conferences, TED Prize, TEDx, TED Fellows, and the TED Open Translation Project. By March 2, 2009, TEDtoChina Chinese site has published over 540 posts and obtained 121,040 visits and 337,290 pageviews from 549 cities in China and 106 countries around the world. In addition, it has inspired Chinese TED fans to form a local community to discuss TED-related topics and local social innovations. As a daily publish website, the TEDtoChina Chinese site has grown into an online hub of the TED phenomena in Greater China area by supporting and reporting local TEDx events, servicing TED Chinese translators, and spreading TED Prize updated reports. For example, our cofounder Tony Yet is the curator for TEDxGuangzhou and TEDxSYSU. We helped to successfully launch TEDxXiamen and reported TEDxTaipei, TEDxShanghai, and TEDxBeijing. We update the program status of the TED Open Translation and manage a Google group for TED Chinese translators. Our team is also active in organizing and supporting TED-inspired offline small group events. For example, we held such events in Beijing, Shanghai, Guangzhou, and Xiamen in October 2009. Currently, we are in the process of building up this English version of TEDtoChina for the purpose of communicating TEDx China events to the global TED community. Martin advocated for college essay help service! Awesome custom paper writing community.